From anechoic chambers to wind tunnels, mass spectrometers to supercomputers, institutions are increasingly looking to share high value items of research equipment. Martin Hamilton outlines how Jisc is working with a variety of partners to help embed and accelerate asset sharing. In this article I will look at three areas where Jisc, with partners including BIS, the Engineering and Physical Sciences Research Council (EPSRC), HEFCE and Innovate UK, is helping to reduce the friction of asset sharing, between institutions and also with industry. Working with EPSRC to make the details of more than £200m worth of high value equipment available for sharing between institutions and with industry. Piloting standard terms and conditions for access to £60m of publicly funded supercomputing facilities and expertise. Providing support for industrial connectivity to the Janet network at speeds of up to 10 Gigabits/second for collaborative R&D projects. Kit-Catalogue is a piece of free software that lets an institution quickly and easily set up its own equipment database, and also provides a data feed of shared items into the EPSRC funded national portal equipment.data.ac.uk. 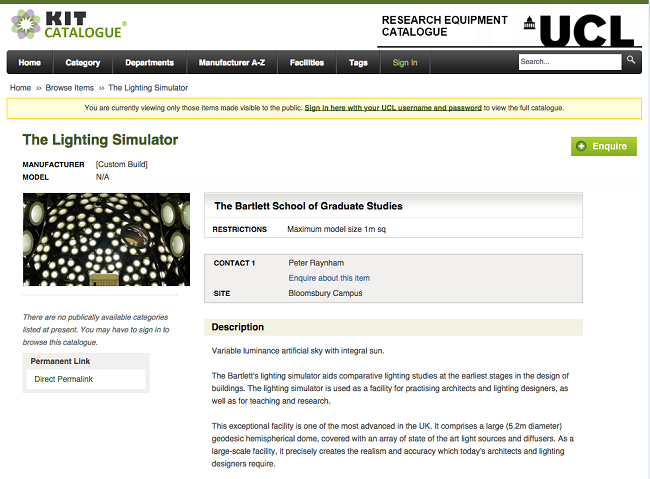 An example of a typical Kit-Catalogue page from University College London - here showing the one-of-a-kind Lighting Simulator at The Bartlett, UCL's Faculty for the Built Environment. Jisc and EPSRC originally funded the development of the Kit-Catalogue software, and I am delighted that we are once again working with the Kit-Catalogue team to explore its potential as a Jisc service, including gathering data on running costs and institutional benefits that will help to inform the business case. With support from HEFCE, we are piloting Kit-Catalogue with ten institutions over a two-year period and also supporting the continued development of the software as part of this initiative. 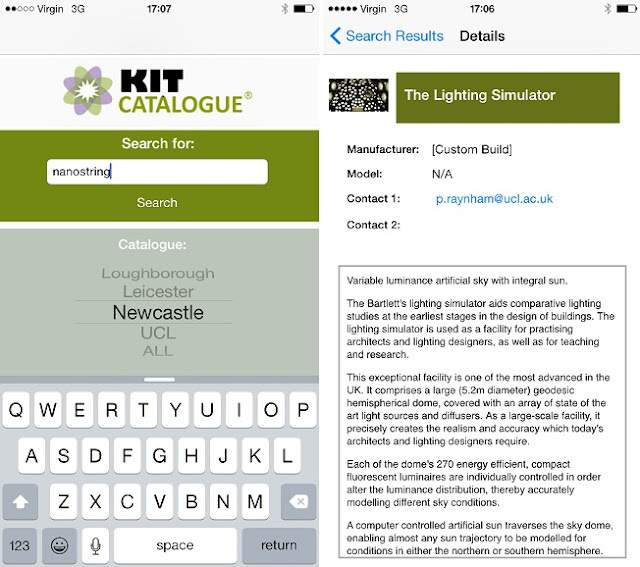 One particular new development that I am very pleased with is our Kit-Catalogue app, available from the Google Play Store for Android devices. The output from Kit-Catalogue contributes (along with other data sources) to the national equipment sharing portal, equipment.data, which makes the details of some 10,000 items of high value research equipment available for sharing. With an conservative average value of £20K-£25K per item, then the total value of equipment being shared is at least £200m. Newcastle University alone is sharing more than 814 items of equipment valued at £20K or above, with a combined value of more than £16m. Before joining Jisc, I set up and then ran EPSRC's HPC Midlands regional supercomputing centre of excellence, a collaboration between Loughborough University and the University of Leicester. During the course of this work it became increasingly apparent that businesses - and also many higher education institutions - were keen to explore a pay-as-you-go model for access to high performance computing and big data facilities, but required formal contractual assurances around service provision. Information security and protection of intellectual property was a key concern. For example, HPC Midlands industrial users required that we destroy any failed disk drives rather than returning to the vendor for replacement. To address these requirements, we worked with Rolls Royce to develop a standardised contract and pro forma covering data security and information assurance, aligned with ISO 27001 standards. I brought this with me to Jisc and with support from HEFCE we subsequently reached agreement with HPC Midlands, HPC Wales, N8 HPC and STFC DiRAC that they would offer their services under this basis. This landmark agreement opens up £60m of publicly funding supercomputing facilities for institutions and industry to access as shared services. I hope that we will be able to extend this approach to other classes of equipment, building on both this work and the Brunswick Agreements. Most of today's research equipment is data intensive, none more so than supercomputing and big data applications. Back in my days of running a supercomputer centre it was not unusual for customers to bring their data over on a hard drive, because connectivity was poor or non-existent between industry and the research and education sector. Whilst this worked well for local firms, and provided a useful opportunity to catch up over a coffee, there was clearly no way that this approach could scale. In parallel, Jisc has received £4m as part of a package of e-Infrastructure funding from the Department of Business, Innovation and Skills (BIS) to support greater interaction between businesses and academia in the e-Infrastructure environment. One component of this is a scheme, Janet Reach, to support high-capacity business connections to the Janet Network in the context of innovative R&D collaboration with academic partners to exploit the e-Infrastructure resources they host and manage. This is another area where I believe that we can act together to give today's data-driven businesses a significant leap forward in capability. Just think what a high-capacity connection at up to 10 Gigabits/second to Janet could do to accelerate your R&D collaborations. Details of the first awards under Janet reach will be made available shortly, but from what I am hearing, I think we will see a good spread of connections from startups and micro-SMEs to major UK firms. The Janet Reach scheme runs until August 2015 as a series of calls modelled on the Innovate UK competition process. The latest call for proposals deadline is 28th February 2015 - we'd love to hear from you. 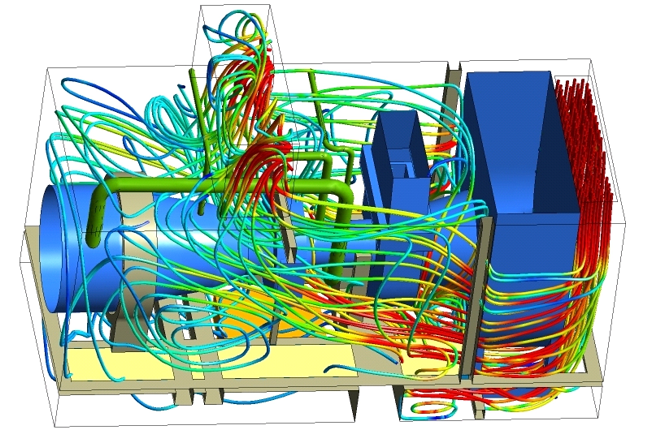 Jisc's Kit-Catalogue pilot and frictionless supercomputing initiative are part of our R&D programme. Martin Hamilton will also be appearing at University UK's annual Efficiency Conference on 25 March in a workshop on equipment sharing. To learn more about the Reach scheme and industrial connectivity to Janet more broadly, please see the Janet Reach homepage.